Over the past two years, Cando Rail Services has worked with Parkland Fuel Corporation to develop one of Canada’s most advanced railcar direct-to-truck fuel terminals. The facility, located in Hamilton, Ontario, was designed and built by Cando, who also operates it for Parkland. It is the first facility of its kind to be built to Ontario’s new Environmental Standards for air emissions. It is also one of the first to offer railcar to truck blending of E-10 Gasoline. Parkland, which is one of North America’s fastest growing independent marketers of fuel and petroleum products, and Canada’s largest fuel retailer, was looking for opportunities to improve its product sourcing options and supply chain reliability in the southern Ontario market, which is one of the highest demand areas in the country. Cando was ideally suited for the job for a few reasons. First, the company is one of the leading rail services companies in Canada, with operations across the country servicing a broad cross section of industries. 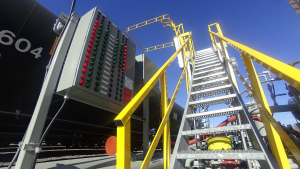 Second, Cando had already developed and demonstrated the transloading technology that would make this site deliver on efficiency and environmental safety – both of which were absolute requirements. With Ontario pipeline and refining capability at capacity, sourcing product by rail became a viable solution. Fuel delivery by rail typically means building a fuel distribution terminal or bulk plant with large storage tanks, along with equipment to blend it to exacting specifications. Cando came up with the concept of a modular and scalable railcar direct-to-truck terminal that minimized initial start-up costs and project lead time, while at the same time not compromising on environmental protection and safety features. “This terminal gives us an edge because we can now source product from pretty much anywhere in North America, have consistency of supply and efficiently have it loaded onto trucks and out to our retail network,” said Boschman. Since opening on a trial basis in 2015, the terminal has met or exceeded expectations for safety and operational efficiency. This initial success of the pilot project led to a Phase II expansion in the fall of 2016, and the facility is now undergoing a Phase III expansion (expected to be on line by summer 2017). In addition to sourcing the land, Cando designed and oversaw construction of the rail terminal. It also manages all aspects of the operation including switching cars, blending and transloading the fuel into trucks, maintenance, inventory management, staffing and administration. The terminal can load multiple trucks with multiple products, with gate to gate times of traditional bulk fuel plants and terminals. Cando received the 2012 Marketing Award presented by the Railway Association of Canada, because of its development of a solution for blending diesel fuel and biodiesel into bio-diesel blends. Cando helped develop an innovative solution using mobile transloading equipment and railcars, eliminating the need for blending tanks, and minimizing capital costs. 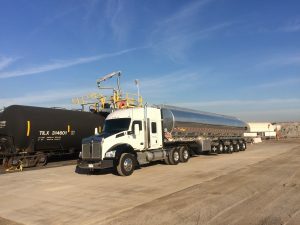 That early work has earned Cando a reputation as a leader in the transload business for petroleum products and over the years, Cando has assembled a national team of internal and external specialists making it an industry leader. Working with gasoline and other fuels means there’s also a certain amount of risk. Facilities that handle dangerous commodities must be designed and operated to a high standard. The Parkland facility uses quality equipment and sound operating procedures to ensure that products can be handled safely, and that potential environmental impacts are mitigated. Ontario’s new environmental legislation has stringent requirements to minimize the release of gasoline vapours into the atmosphere. 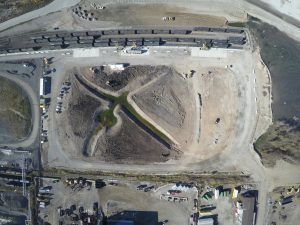 The Hamilton rail terminal is the first to be built to these new Ontario standards. Cando worked with Hall Technologies to design and build the transloading equipment. One of the innovative features of the Hamilton facility is that all of the above ground equipment is completely modular. When required, Cando could disassemble and relocate the facility to another location, if required, to meet customer needs. The system can load rail-to-truck or truck-to-rail and is equipped with RFID card readers too which allows for automated bill of lading capabilities. The work for Cando and Parkland hasn’t gone unnoticed. Recently, Cando has been asked to advise on a number of new projects. Read more about the work we do for Parkland in Hamilton in our case study.